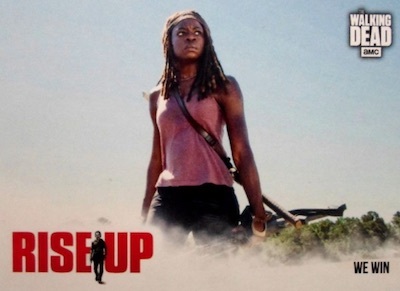 Featuring the key storylines from the series, 2018 Topps Walking Dead Road to Alexandria looks back at the struggle for survival. 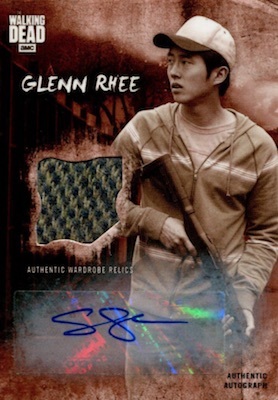 Each hobby box contains two hits, with at least one autograph from AMC's The Walking Dead. 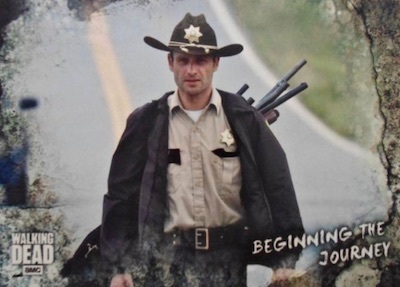 Similar to Walking Dead Evolution, 2018 Topps Walking Dead Road to Alexandria takes a retrospective approach to the first seven seasons. However, instead of focusing on the changes in the main characters like Evolution, Road to Alexandria is based on the events at the Safe-Zone, and how the survivors ended up there. TWD Road to Alexandria offers 100 base cards, and adds six distinct parallels: Rust (1 per pack), Blue (#/50), Mold (#/25), Sepia (#/10), Black and White (#/5), and Blood Red (1/1). 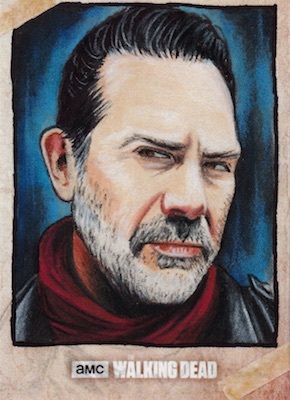 There are also several inserts available in the 2018 Topps Walking Dead Road to Alexandria checklist, such as Characters, Better Days, which highlights the fleeting moments of tranquility, the group-based Factions, the Walmart-only Rise Up, and Walker Hall of Fame for the most notable Walkers. The inserts combine to fall one per pack. As far as the more limited cards, premium TWD hits drop two per hobby box. 2018 Topps Walking Dead Road to Alexandria includes the main Autograph insert with Rust (#/99), Blue (#/50), Mold (#/25), Sepia (#/10), Black and White (#/5), Blood Red (1/1) and Printing Plates (1/1). There are also rare Dual Autograph and Triple Autograph versions. Likewise, the Road to Alexandria relics come in several forms. 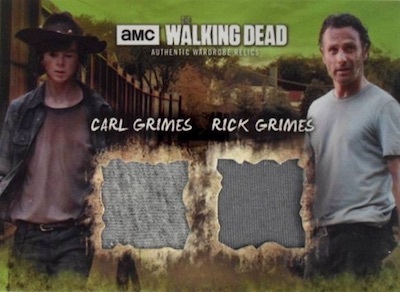 The primary Costume Relic set contains screen-worn pieces from the series via base, Rust (#/99), Blue (#/50), Mold (#/25), Sepia (#/10), Black and White (#/5) and Blood Red (1/1) editions. Tying in more elements are Dual Relic, Autographed Costume Relic, and Dual Autograph Relic cards. Working with characters from throughout the show's run, Sketch cards display original artwork of subjects who appeared in the first seven seasons. WALKING DEAD ROAD TO ALEXANDRIA STEVE COULTER REG MONROE AUTOGRAPH CARD # 50! 100 cards. Shop base sets on eBay. PARALLEL CARDS: Rust (1 per pack), Blue #/50, Mold #/25, Sepia #/10, Black and White #/5, Blood Red 1/1. 13 cards. Shop TWD autographs on eBay. PARALLEL CARDS: Rust #/99, Blue #/50, Mold #/25, Sepia #/10, Black and White #/5, Blood Red 1/1, Printing Plates 1/1. 10 cards. Shop TWD autographs on eBay. PARALLEL CARDS: Black and White #/5, Blood Red 1/1, more TBA. Chad L. Coleman and Lawrence Gilliard Jr.
6 cards. Shop TWD autographs on eBay. 3 cards. 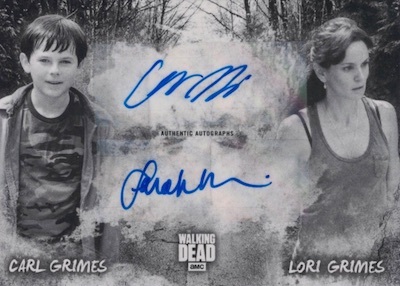 Shop TWD autographs on eBay. PARALLEL CARDS: Rust #/99, Blue #/50, Mold #/25, Sepia #/10, Black and White #/5, Blood Red 1/1. PARALLEL CARDS: Mold #/25, more TBA. The Walker and Daryl dual relics are not Walmart only. Just pulled one out of hobby. Either that or the Dual Relic checklist is incomplete. 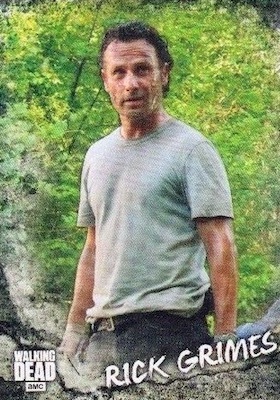 Needs to be more Andrew Lincoln autograph and costume relic, etc. cards! I mean after all he is the main character and a popular one too! I got a worthless card. It is a costume relic. 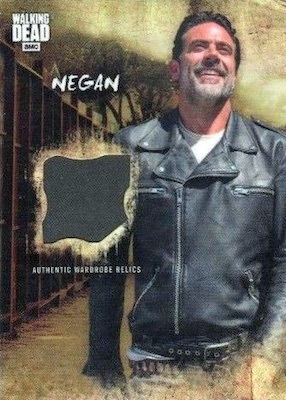 The card has a picture of Daryl Dixon and a piece of a bat. You would think it’s a piece from Lucille. Well, it’s not. It says on the front “Commemorative bat piece inspired by Negan’s bat Lucille.” It says on the back “This relic was not featured on AMC’s The Walking Dead.” For this one, all I can say is big deal. It’s a piece of wood that has nothing to do with the show.